Anyone who does sublimation or has done sublimation most likely has contemplated sublimating mugs at some point. People who are considering sublimation are often considering it because it offers the opportunity to create personalized mugs. Everyone likes a mug with a design that has meaning, and creating those mugs can be relatively easy, if you keep the following tips in mind. Tip 1: Buy the right kind of mugs – Any good that is sublimated must be either made of polyester materials or poly coated. If you’re looking for dishwasher safe mugs, you will also need to look for mugs that have the ORCA coating. All the mugs that EnMart sells, both the 11 oz. mugs and the 15 oz. mugs, have this coating. Our frosted glass beer mugs also have this coating. 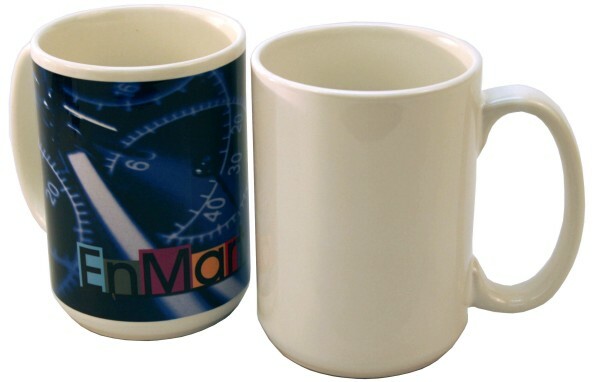 Tip 2: Find the optimum image area on your mug – Mug size and design can vary slightly from batch to batch. It is always a good idea to create a test mug. This will allow you to find the proper placement for your design and will help ensure that placement will be correct on future mugs. Tip 3: Make sure your transfer is secure – Sublimation heat tape is always a great way to secure your design to the mug. The tape will ensure that your transfer doesn’t slip or slide during the pressing process. Tip 4: If you use a press, take into account every type of mug you want to sublimate – Some mug presses are designed only to handle the smaller types of mugs, or conventionally shaped mugs, which leaves out options like latte mugs or travel mugs. To get the most out of your press, you need one that is versatile, like the DK3 Mug Press from George Knight. Tip 5: Wraps are a viable option too – If you are doing a large number of mugs, it might be quicker to sublimate the mugs using a mug wrap and an oven. You can use anything from a toaster oven to a conventional oven as long as it can heat up to 400 degrees. Sublimating and cooking in the same oven is also not recommended. Tip 6: Mugs need to cool off after pressing – Once you’ve finished sublimating your mug, cool it off in a bath of lukewarm water. This will stop the sublimation process. Make sure the water is not too cold, or you may crack your mug.